She belongs to the Kahnweiler’s group of artist in the twenties of last century. She was the only artist-woman in the gallery. She was a young and cultivated painter; she studied in the Lycée Racine and later in the Académie Ranson. Was married with the painter and sculptor André Beaudin. When in 1928 they meet Francisco Bores, a deep relationship was born. An interrelation between the three painters’ stylistic evolution took place. In 1923 she had her first individual exhibition in the Galerie Simon. It did followed other ones in Galerie Louise Leiris until 1979.The second exhibition had a great success; collectors as Edmond Jaloux, Roger Duthilleul or Léonce Rosenberg, acquired works for their collections. Some of her best paintings were inspired with the Spanish Civil War. She showed drawings in la Maison des Beaux-Arts(1945) and etchings and litographys in the Galerie Jean Aubier (1948). From 1937 she starts participating in international exhibitions: Sweden, Germany, Switzerland, England and USA. In 1986 the Galerie Leiris organised a posthumous homage-exhibition. To commemorate her birth’s century in 1998, another exhibition was organized. 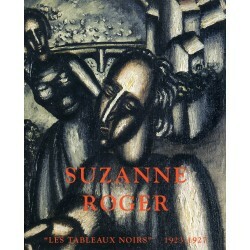 Suzanne Roger as well illustrated works from Max Jacob and Tristan Tzara. ROGER Suzanne There is 1 product. Catalogue Artist: Suzanne Roger Title: "Les tableaux noirs (1923-1927)" (catalogue from the exhibition that took place at the Galeria Joan Gaspar, Barcelona) Year: December 2004 Size: 26,7 x 21,7 x 0,4 cm. Pages: 83 Illustrations: 37 (photography: Rocco Ricci) Attention! The colour that you see at you screen may vary from the original catalogue.